It’s common for riders to spend time in the gym building physical fitness for greater proficiency in the saddle. 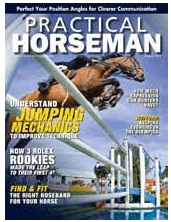 Author Tonya Johnston, a lifelong hunter/jumper rider who is a mental skills coach, outlines a variety of sport psychology techniques designed to help equestrians build their mental facilities for the next horseback outing, whether it’s a hack through the woods or a competition on the A-circuit. Inside Your Ride teaches you how to get mentally fit for riding. Johnston calls on her more than 20 years of experience to offer insights, advice and detailed exercises on how to set goals, conquer fear, improve your focus and increase your confidence and mental strength. 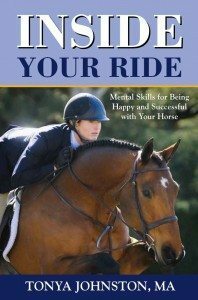 She also includes quotes from interviews with elite U.S. riders and trainers about their psychological approach to consistently achieving success on national, international and Olympic levels. The thoughts they express on riding, teaching and competing are eye-opening, inspirational and instructive. I was surprised and delighted at the openness and honesty of riders like Courtney King-Dye and Debbie McDonald as they shared what it was like for them to overcome fear and handle disappointment. Listening to them voice their own doubts and concerns made me feel that I could confront mine and come up with a strategy for conquering them. This book is easy to understand and gives straightforward, workable solutions to problems any rider is likely to encounter: returning to the saddle after a fall, coping with failure and communicating with your horse, your trainer and your friends who aren’t equestrians. As Johnston points out, developing these mental skills can have a positive effect on other aspects of your life. A cost-effective means for reaping the sort of benefits that come from a few sessions in the gym or lessons with your horse in the arena, this book is a worthwhile addition to virtually every equestrians library.